Join the discussion on our forums! 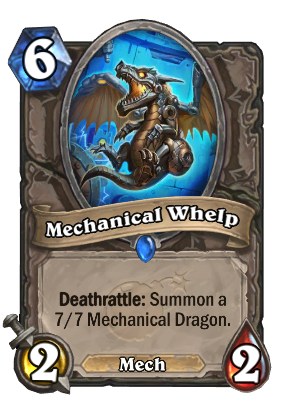 Come discuss Mechanical Whelp over in our dedicated Mechanical Whelp discussion topic. 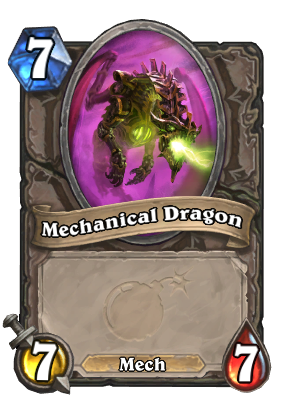 Guys why the mechanical dragon look so green?Is it powered by fel? T8: random hero power, this, attack w/rush, get the 7/7, attack w/rush! (...) This is worse than Dr.Boom for 1 less mana if it was battle cry and Dr.Boom sees zero play in wild past rank 5. Garbage, very slow and the pay off isn't even there. I'm not sure it's good even if it were a battle cry. This is worse than Dr.Boom for 1 less mana if it was battle cry and Dr.Boom sees zero play in wild past rank 5. In constructed, this cards purpose is more generalized as being a deathrattle and mech. In terms of the mech part, you could see it used in Mech Warrior if that is a meta deck. Otherwise more likely it is meant to try and assure that you have a mech body to magnetize. My Eggmancer deck is going to love this card. Making copies and bringing them back with Twilight's Call. Apart from the card being playable, interesting choice that Blizzard had to make here. To be a Dragon or a Mech, that is a question. I hope this is the first of many Star Aligner enablers.